Teachers have had a major impact on Utah Jazz guard Donovan Mitchell’s life. His mother, Nicole, teaches preschool, and stressed the value of education to Mitchell when he was a young child. Given that relationship, it was no surprise Mitchell was a vocal supporter of teachers during the Los Angeles teacher’s strike in January. On Thursday, the 22-year-old Mitchell decided to pay back another teacher who made an impact on his life. Following the Jazz’s 117-114 loss to the Atlanta Hawks, Mitchell surprised his fourth-grade teacher’s daughter with a $25,000 scholarship. The moment was shared by Jazz digital sports reporter Eric Woodyard on Twitter. When presented with the check, Naja Brooks isn’t sure how to respond. She’s just shocked. Even when Mitchell goes in for a hug, Brooks admits she doesn’t know what to do with the giant check she’s just been handed. 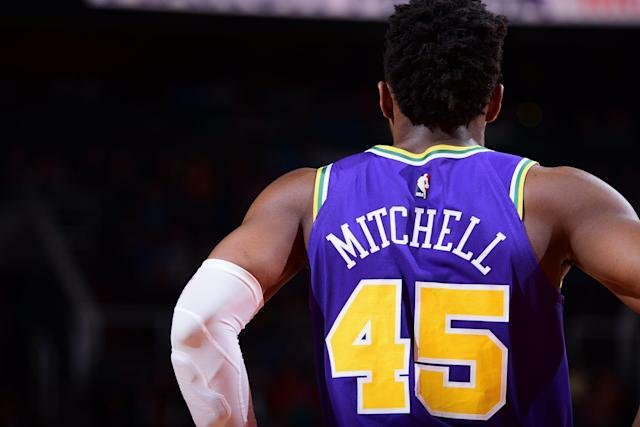 In his second season in the NBA, Mitchell is averaging 23.6 points and 4.1 assists per game with the Jazz. Thanks to his contributions, the Jazz are 42-30 in the playoff hunt. As Thursday’s video proves, Mitchell’s off-the-court contributions are even greater.